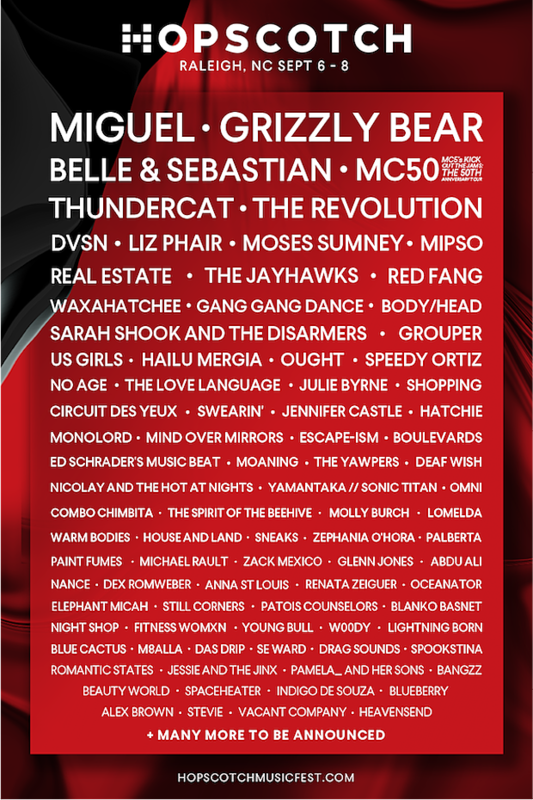 The Hopscotch music festival returns to downtown Raleigh September 6-8, and the 2018 lineup includes Miguel, Grizzly Bear, Belle & Sebastian, MC50 (aka MC5 member Wayne Kramer’s Kick Out the Jams 50th anniversary tour with members of Soundgarden and Fugazi), Thundercat, Prince’s backing band The Revolution, dvsn, Liz Phair, Moses Sumney, Real Estate, The Jayhawks, Red Fang, Waxahatchee, Gang Gang Dance, Body/Head, Sarah Shook & the Disarmers, Grouper, U.S. Girls, Hailu Mergia, Ought, Speedy Ortiz, No Age, The Love Language, Julie Byrne, Shopping, Circuit des Yeux, Swearin’, Jennifer Castle, Hatchie, and more, plus even more TBA. See the full initial lineup below. TIckets go on sale Friday (5/18) at 10 AM Eastern.